When John Moriarty, SIS/BA '79, first arrived at American University, he wouldn’t have suspected that the woman working at the front desk of McDowell Hall would become his lifelong partner. According to John, he noticed Ruth Bass Moriarty, CAS/BA '78, his first day on campus, while moving into the residence halls. He was immediately impressed. It wasn’t until the end of John’s sophomore year that the opportunity presented itself again. While John was studying in the common room of Alpha Epsilon Pi, Ruth, a member of Delta Gamma, came looking for one of John’s fraternity brothers, planning to ask him to her sorority’s formal. As luck would have it, his fraternity brother was out. “So, taking a deep breath, I told Ruth I didn't know where my fraternity brother was but that I would let him know she was looking for him,” he explained. Thinking on his feet, John then asked Ruth if she would go to his fraternity’s formal. “Imagine my surprise when she said yes!,” he recalls. 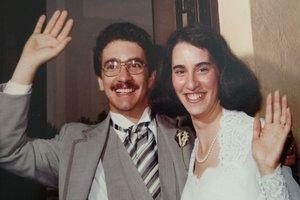 On August 2,1981, the two were married on a Sunday afternoon in Ruth’s hometown of Cherry Hill, New Jersey, and this summer will celebrate their 38th anniversary. Today, John is a senior executive with the IRS Office of Chief Counsel, where he manages approximately 100 tax law professionals. This past summer, Ruth retired from Montgomery County (Maryland) Schools, where she worked as a paraeducator helping students with special needs. Being college sweethearts means so many shared experiences and memories. John and Ruth share numerous friends from their time together at AU, and still reside in the Washington, DC area, allowing them to remain connected with their fellow Eagles. Did you too meet your partner while at AU? Share your story on social media using the hashtag #AUSweethearts!